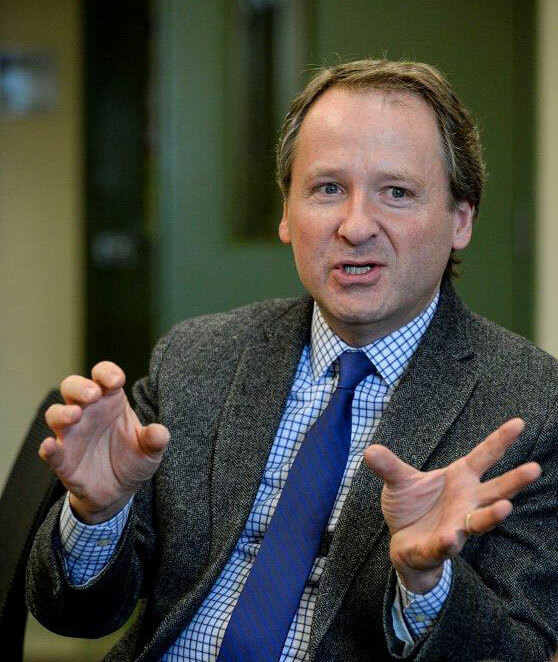 David Schmidt, director of undergraduate programs in the Department of Earth and Environmental Sciences, has found a welcoming audience in the community for his research on how geology has influenced the Dayton region’s history. The Dayton region sits over enormous underground canyons that would likely be national parks if they were on the surface. The region’s plentiful supply of fresh clean water is largely responsible for Dayton’s rise as a major manufacturing center in the 20th century. And Dayton’s limestone-like dolostone was quarried centuries ago, but can still be seen today in building foundations, curbs, tombstones and the Old Courthouse. These are some of the geologic gems in the arsenal of David Schmidt, Ph.D., director of undergraduate programs in the Department of Earth and Environmental Sciences at Wright State’s College of Science and Mathematics. And Schmidt has begun sharing his wealth of knowledge with local residents as part of the university’s community outreach efforts. Schmidt’s presentation in February — titled “Boulders, Bedrock and Brewing Water: How Local Geology has Influenced the History of Oakwood and the Surrounding Area” — drew a standing-room-only audience of more than 115 people to The Oakwood Historical Society. “It was obvious with people sitting on the floor and spilling out the doorway that this was a topic of great interest,” the society wrote in its newsletter. Schmidt grew up in a west Kettering home surrounded by vacant lots and new construction that supplied ample piles of dirt and rock to explore. 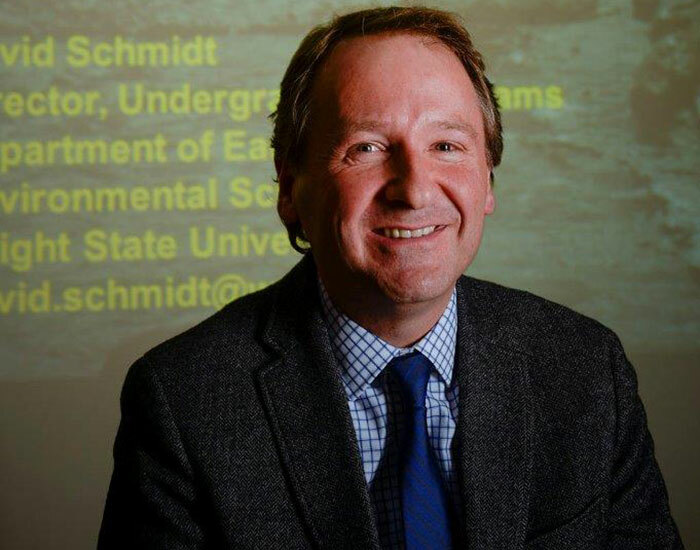 Schmidt received his bachelor’s and master’s degrees in geology at Wright State and his Ph.D. in geology from The Ohio State University, where he investigated the paleontology and sedimentary geology of Ohio and Indiana. He was hired by Wright State in 2007 and primarily recruits and advises undergraduate students. His interest in local geology, its effect on the human history of the area and how it can lead to future economic growth and jobs led to the development of his presentation. That growth could create demand for scientists who understand how to treat water and do environmental permitting. The region has 1.5 trillion gallons of fresh clean water. It is a prize that would be valued by other areas such as southern California, which is moving to purify seawater, and by Florida, where sinkholes created by overdrawing water out of the ground are swallowing cars and homes. In the area’s early geologic history, bedrock was deposited, the seas receded, and the area was subjected to a long phase of weathering and erosion. Large canyons were cut into the bedrock. “If we didn’t have all of the glacial material over the top, we might have some spectacular national parks here because these canyons are miles wide and hundreds of feet deep,” Schmidt said. Much of the bedrock underlying the region is called the Dayton Formation and consists of dolostone, a sedimentary carbonate rock that contains a high percentage of the mineral dolomite. The enormous reservoir of underground water was instrumental in Dayton’s economic development, helping give rise to NCR, Delco, Frigidaire, soap companies and breweries. Businessman Adam Schantz of Oakwood had a patent for aerating and purifying water. Called Lily Water after the lily on the family crest, Schantz used the purified water in brewing and producing bottled water long before it was fashionable. The region had several hydraulic power districts that channeled river water to mills and other industries. Water wheels would provide rotary power through belts and pulleys for drill presses, lathes, sewing machines and other machinery. “You don’t hear much about that, but it’s an important part of Dayton’s early history,” Schmidt said. There is also a sizable, now largely underground waterway called Rubicon Creek that runs along the Dayton-Oakwood border. The creek powered local mills and was followed by the railroad line that brought the quarry rock into Dayton. “Unless you’re looking at the history books, you may not even know that creek exists,” Schmidt said. Businesses in Dayton were taking water out of the ground faster than it was going back in until about 1970, when manufacturing began to wind down. Today, the water table is back up and occasionally creates flooding problems for low-lying Sinclair Community College, the Montgomery County Administration Building and the University of Dayton Arena. The water is clean because as it percolates down through the sand and gravel, contaminants adhere to the surfaces of the particles. But the limestone makes it very hard, enabling water-softener companies to do a good business. When he is not recruiting and counseling students, Schmidt teaches an occasional class at Wright State. He says the university is a special place. Schmidt’s interests extend beyond geology. His outdoor adventures have included scrambling up mountains in Wyoming and Montana, canoeing past wild moose in Idaho, crawling through caves in Kentucky and scuba diving in the Bahamas.